(Nanowerk News) The extraordinary promise of quantum information processing — solving problems that classical computers can’t, perfectly secure communication — depends on a phenomenon called “entanglement,” in which the physical states of different quantum particles become interrelated. But entanglement is very fragile, and the difficulty of preserving it is a major obstacle to developing practical quantum information systems. 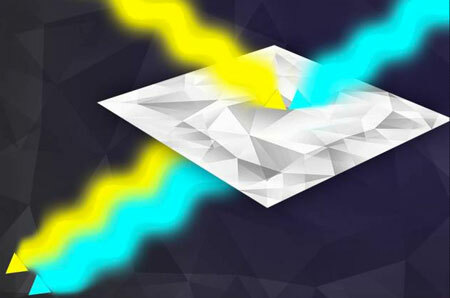 In a series of papers since 2008, members of the Optical and Quantum Communications Group at MIT’s Research Laboratory of Electronics have argued that optical systems that use entangled light can outperform classical optical systems — even when the entanglement breaks down. Two years ago, they showed ("Entanglement’s Benefit Survives an Entanglement-Breaking Channel") that systems that begin with entangled light could offer much more efficient means of securing optical communications. And now, in a paper appearing in Physical Review Letters, they demonstrate that entanglement can also improve the performance of optical sensors, even when it doesn’t survive light’s interaction with the environment. Entanglement means that the physical state of one particle constrains the possible states of another. Electrons, for instance, have a property called spin, which describes their magnetic orientation. If two electrons are orbiting an atom’s nucleus at the same distance, they must have opposite spins. This spin entanglement can persist even if the electrons leave the atom’s orbit, but interactions with the environment break it down quickly. In the MIT researchers’ system, two beams of light are entangled, and one of them is stored locally — racing through an optical fiber — while the other is projected into the environment. When light from the projected beam — the “probe” — is reflected back, it carries information about the objects it has encountered. But this light is also corrupted by the environmental influences that engineers call “noise.” Recombining it with the locally stored beam helps suppress the noise, recovering the information. The local beam is useful for noise suppression because its phase is correlated with that of the probe. If you think of light as a wave, with regular crests and troughs, two beams are in phase if their crests and troughs coincide. If the crests of one are aligned with the troughs of the other, their phases are anti-correlated. But light can also be thought of as consisting of particles, or photons. And at the particle level, phase is a murkier concept. Instead, quantum mechanics interprets phase statistically. Given particular measurements of two photons, from two separate beams of light, there’s some probability that the phases of the beams are correlated. The more photons you measure, the greater your certainty that the beams are either correlated or not. With entangled beams, that certainty increases much more rapidly than it does with classical beams. When a probe beam interacts with the environment, the noise it accumulates also increases the uncertainty of the ensuing phase measurements. But that’s as true of classical beams as it is of entangled beams. Because entangled beams start out with stronger correlations, even when noise causes them to fall back within classical limits, they still fare better than classical beams do under the same circumstances. In experiments that compared optical systems that used entangled light and classical light, the researchers found that the entangled-light systems increased the signal-to-noise ratio — a measure of how much information can be recaptured from the reflected probe — by 20 percent. That accorded very well with their theoretical predictions. But the theory also predicts that improvements in the quality of the optical equipment used in the experiment could double or perhaps even quadruple the signal-to-noise ratio. Since detection error declines exponentially with the signal-to-noise ratio, that could translate to a million-fold increase in sensitivity.